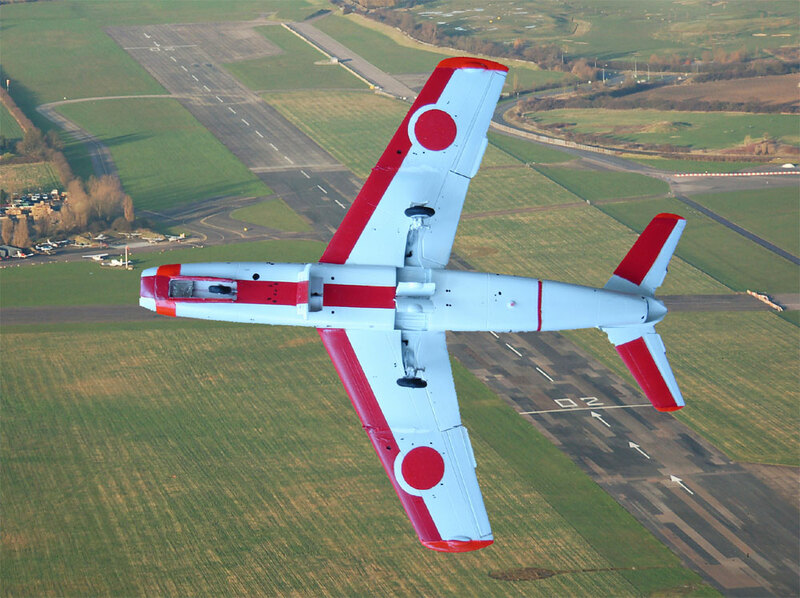 The Fuji T-1, which first flew in January 1958, was developed as a trainer in Japan. 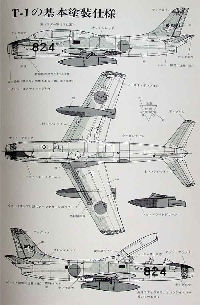 It's layout has clear resemblance with the North American Sabre with nose air intake and swept wings. The jet engine was based on the Bristol Orpheus. The T-1 is a tandem seat trainer with a upwards opening canopy. 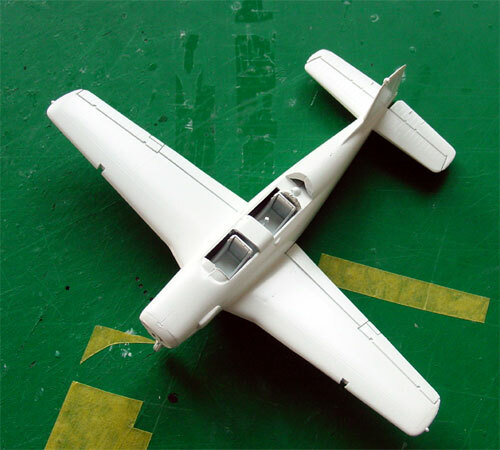 ..
- add a cockpit interior with some new instrument panels and some new seats; these can be obtained from a commercial set or made from plastic card ; it is rewarding to put in some effort here as it can be readily seen. 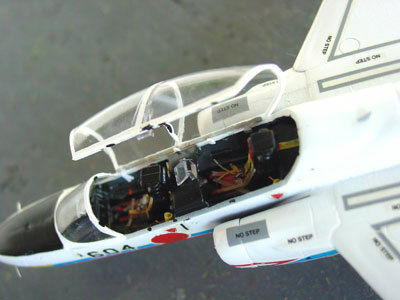 Do not forget to cramp in enough nose weight, otherwise your model will not stand on its nose gear ! Used were some coats of varying grey on the interior and the droptanks can be seen with each a inner darkgreen antiglare panel and overall a metal look. 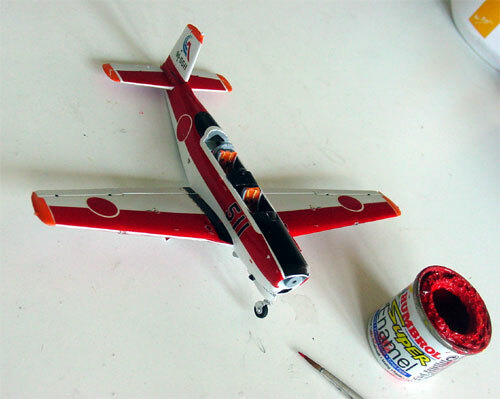 The most challenging bit of the model is the paint scheme. 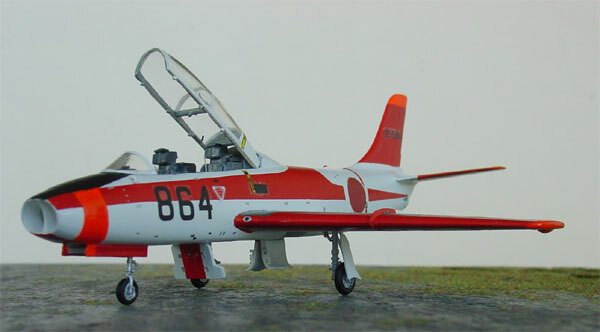 The old kit version I had had only markings for a very simple white T-1 of the 13 TW of the JASDF. 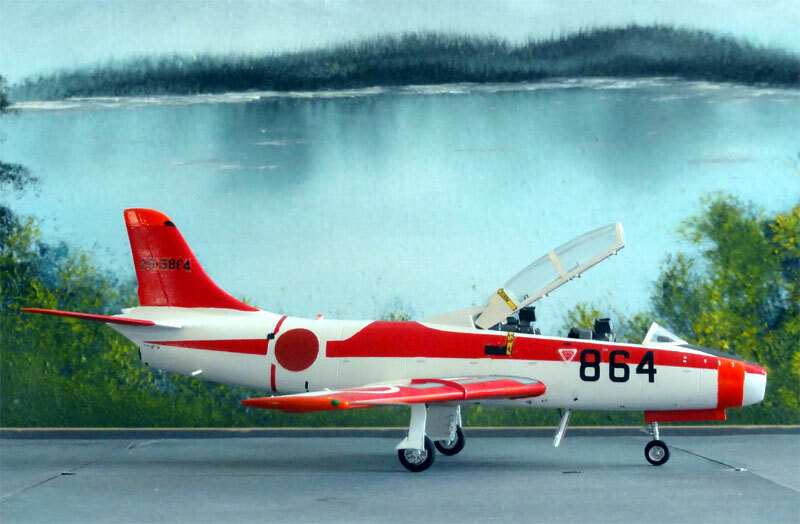 Looking at pictures and references, many T-1's were flown in very nice red-orange markings. 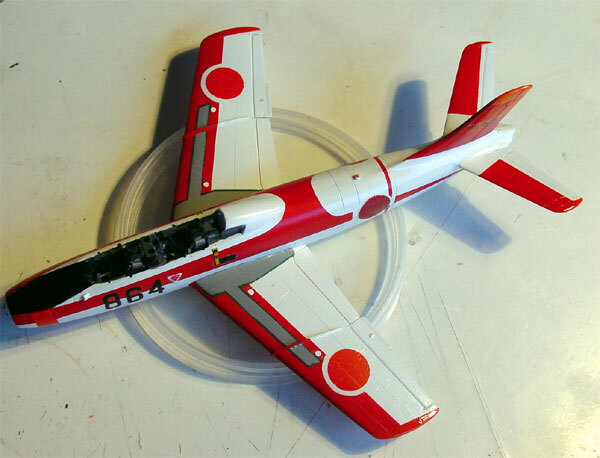 I decided to go for it and make such a colourfull scheme with some painting, spraying and red decals. 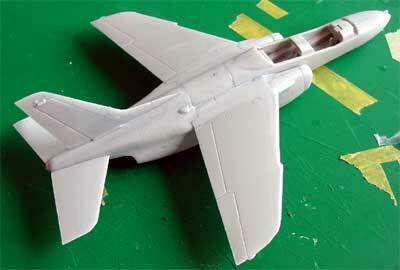 Leave of the pylons and underwing tanks until you finished adding these markings on the lower wings. 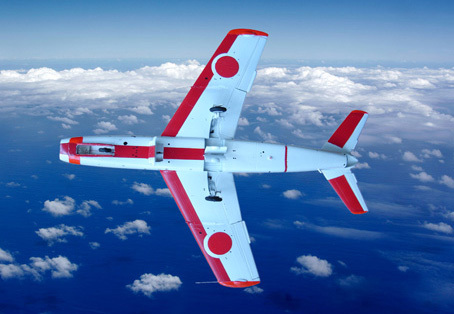 The scheme is for a basic white plane with red markings and dayglow and orange panels here and there. Difficult was adding the "dayglow orange". I tried to airbrush / spray it, but it did not work right. It clogged the airbrush and was not an even finish. Later on, it was discovered that I should have simply painted the small panels with a paint brush. Paints used were Humbrol white, Humbrol #18 and #209 oranges. 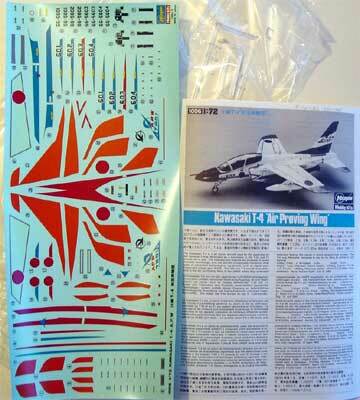 The provided Hasegawa decals were very old and would hardly come of their paper backing sheet. Some of them broke! I tried to replace the decals as much as possible, for example the Red national marking. 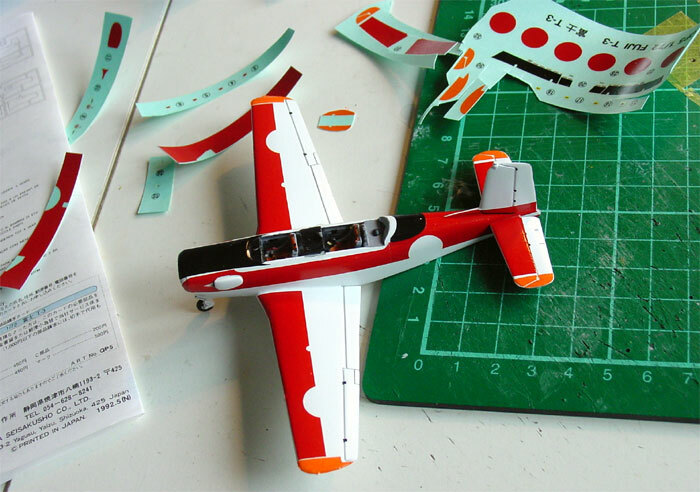 These markings also have on many planes a very distinctive white border, for which I used cut out white disks from decals (two layers being needed!). The walkways have a particular shape, I painted in a dark grey finish. Lettering came from the spare decal box and same goes for the red disks. 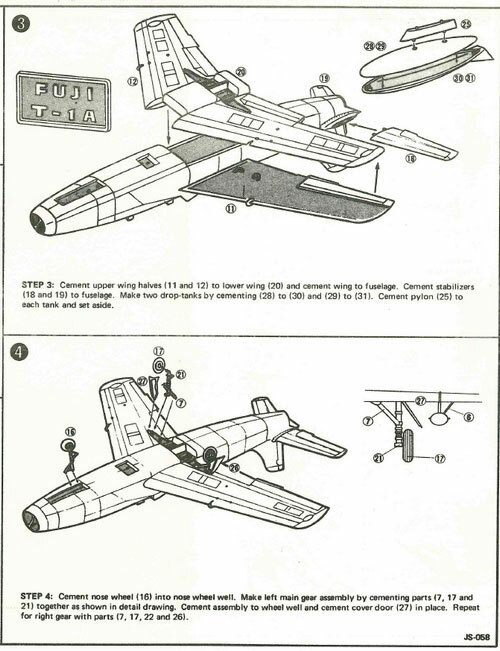 Next, assembly of landing gear was not a problem. Finally, the end result is striking with a nice result for such an old kit. 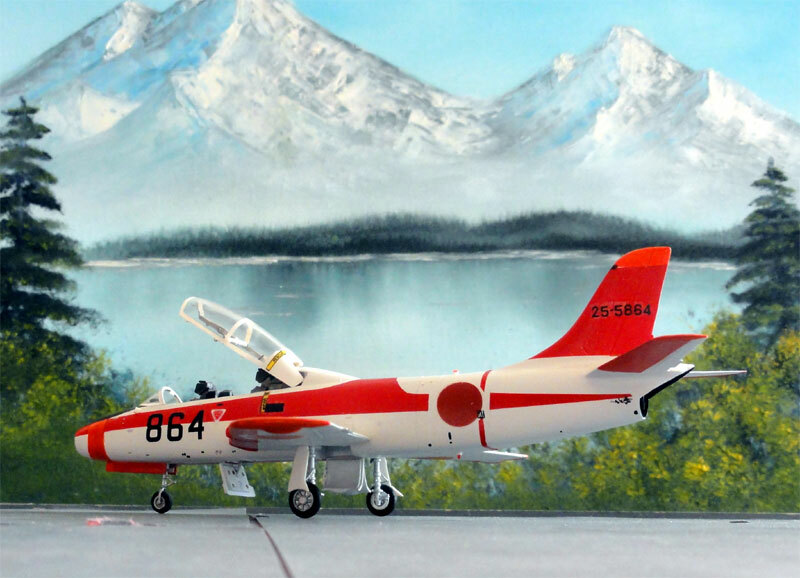 A model you don't see actually built that often. 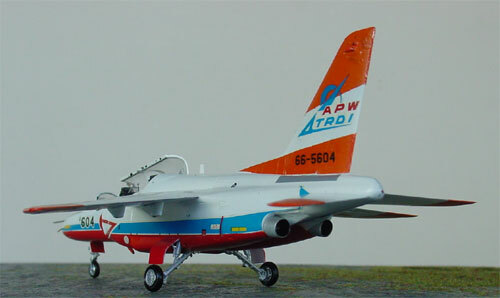 The T-4 was developed a a successor the the Lockheed T-33 and the Fuji T-1. 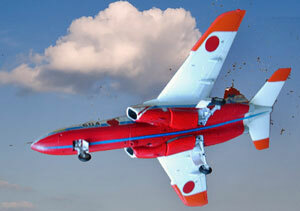 It first flew in 1985 and was entirely developed in Japan. 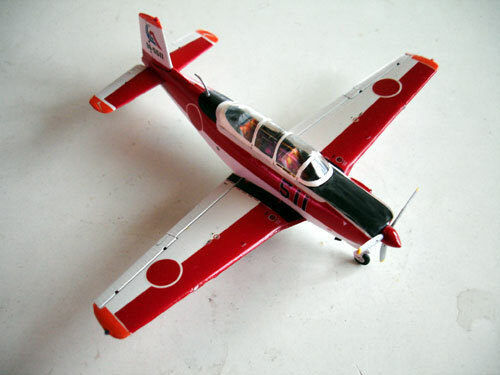 The plane has layout characteristics typically of other trainers like the European Alphajet. 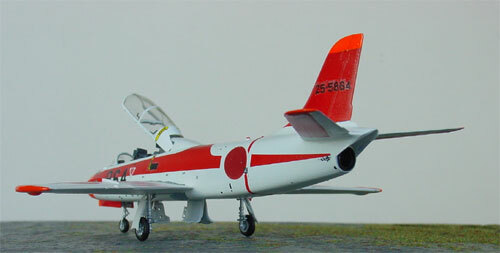 The 1/72 Hasegawa kit no. 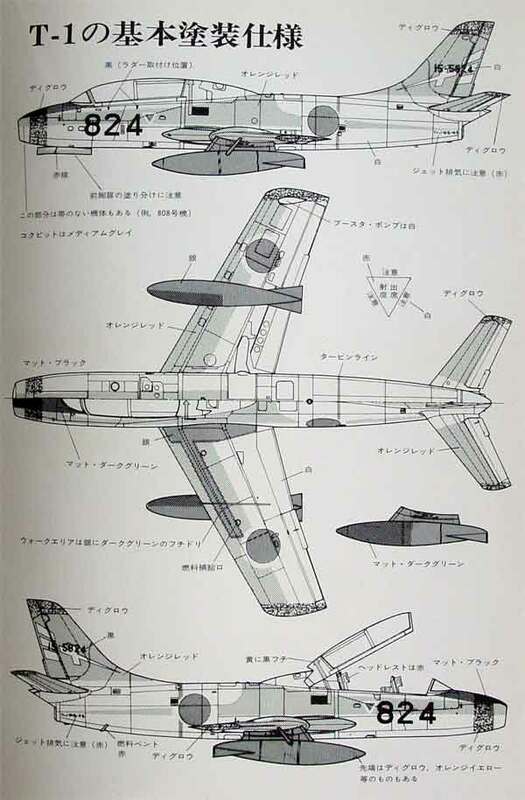 1006 from 1989 has about 60 parts in the usual Hasegawa style. 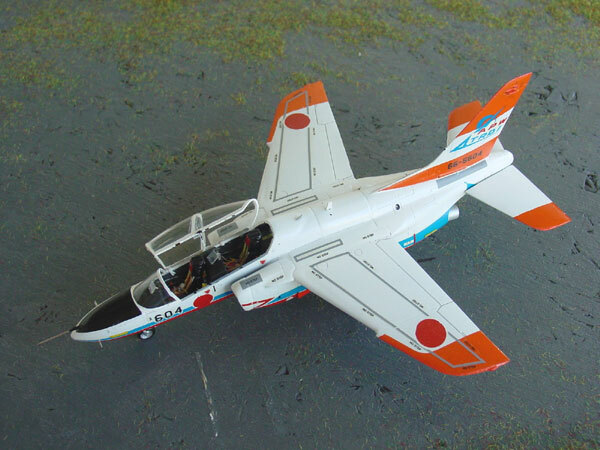 One of things that was strange was the bad fit of this kit, not typical for Hasegawa. 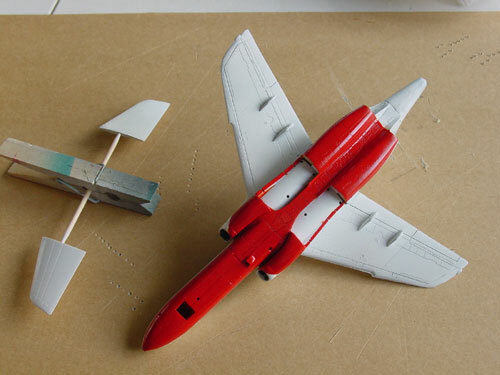 The air intakes and lower fuselage and wing-fuselage joint needs a lot of filler and clean up work. 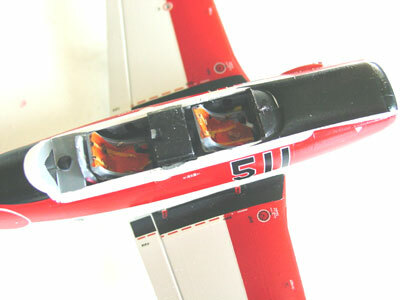 - add a glass panel within the right hinged canopy between the forward and aft pilot tubs. - take care when fitting the main wheels; I had the problem to glue and fix them in the right angles. 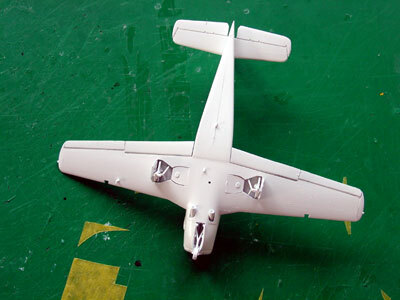 After basic assembly and filling, add a white base coat. Start with a matt coat, than airbrush on a gloss coat. 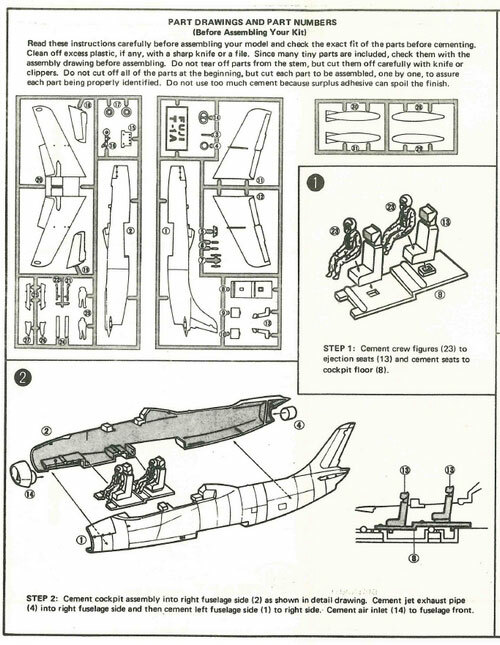 I did not add any underwing stores, prefering a clean plane. If you want, fit them only after you finished the paint scheme. Unfortunately the decals tend to break up in water as they are very thin and weak. I recommend putting on a coat of Microscale Liquid Decalfilm before you start decalling. 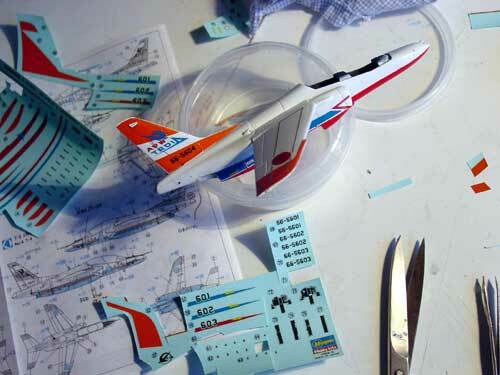 Finishing: this kit provides the option to quite some nice looking schemes. 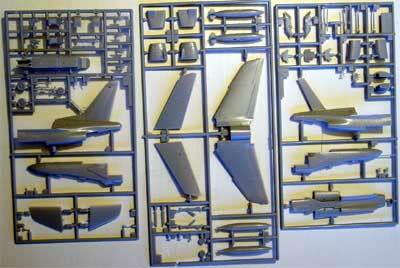 Carefully select which one you want to make as it needs carefull planning for painting. I made the T-4 option no. 4 . Walkway stripes were a bit of a headache as still they tend to break up. 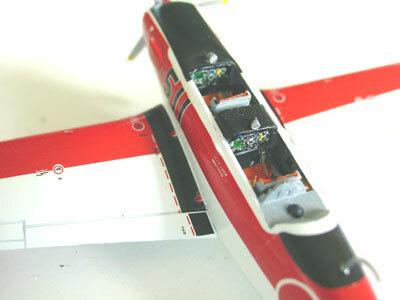 Although the decals merely cover every panel, some painting is required. 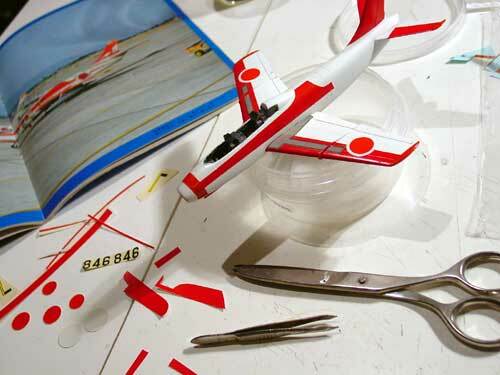 But when you carefully look, you can avoid this by cutting up some of the left over decals from the provided sheet. 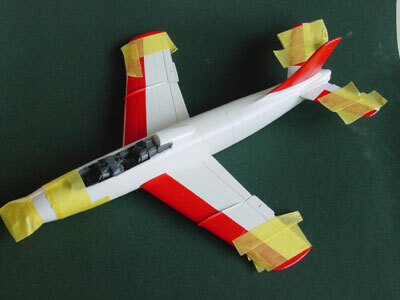 For example this can be done for the vertical tail surfaces. 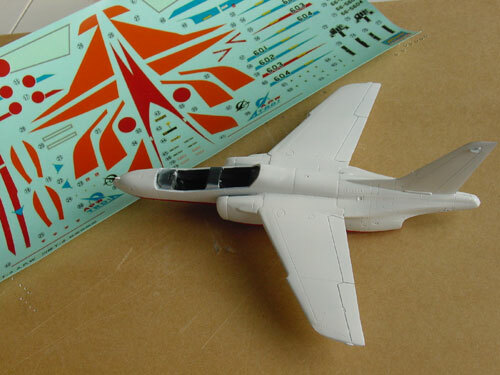 However, at the wing edges, you still need to paint as the decals do not 100% match the shapes. I tried to match the decal colour as much as possible by mixing different paints of orange. Almost ready with still to be done: adding a decal protecting gloss coat of Johnson Future and matting the tyres. 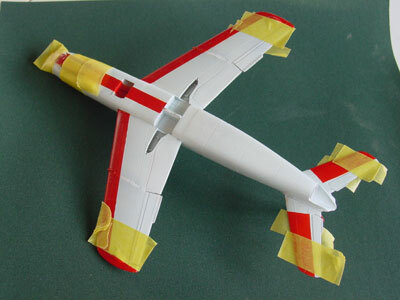 It takes quite some work , but the end result is a very colourfull model in the collection. It was a primary trainer with a prop. 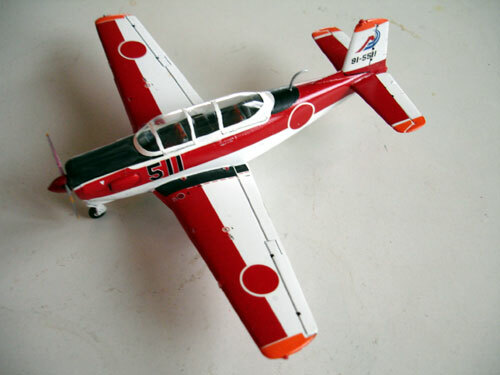 The kit is from Hasegawa and is very old, from the 1970s. 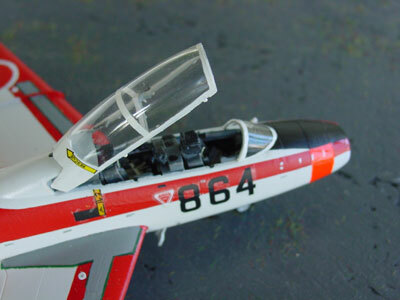 The model was made almost straight out of the box, with some extra detailling in the cockpit. 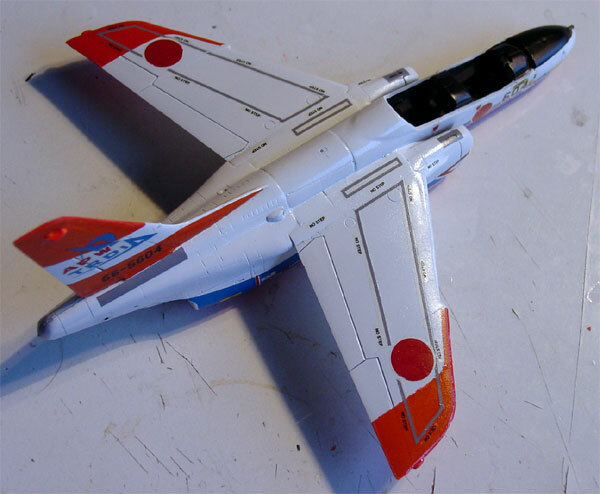 The colour scheme was made from spare decals and by masking and spraying. The colours are as usual very bright. 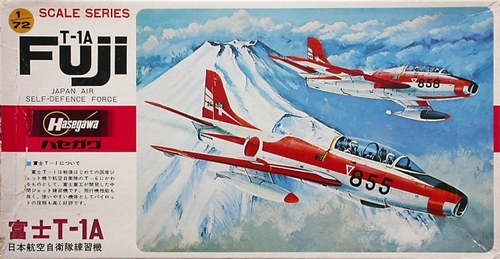 (note: this kit was also issued with different decals by Hasegawa; my kit used a very old release).